Take advantage of selected partially in-house developed brand products at unbeatable prices. As a member you can purchase items in our online shop as often as you desire. 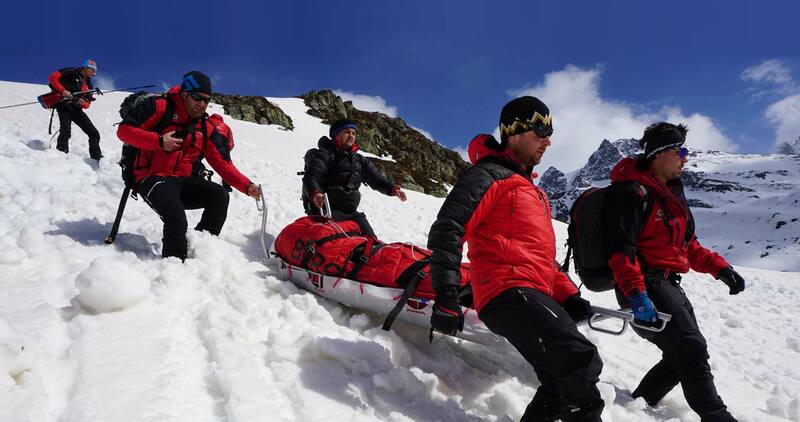 This year our calendar shows activities of mountain rescuers. Our smart all-rounder is featured on an individual page. Recommended by the experts! "Sleeping bag" for your mobile phone. This insulated pocket helps to save battery life during cold conditions. An integrated RECCO® reflector can help to locate the owner in an emergency situation. The helmet is certified for skiing, climbing, and bicycle riding as well as equipped with the Recco Detection System. The shell is available in three sizes and permits a continuously variable adjustability for all head sizes. Two first aid kits for the price of one! Inside the well-arranged and fold-out backpack pharmacy is an additional first aid kit which can be ideally fastened onto the climbing harness. The dressing materials were selected by the Mountain Rescue Tirol and allows for the initial treatment of common injuries. EXTRA: Included in the set is a valuable brochure on the subject of first aid which provides practical tips for using the set during an emergency. Recommended by our medical unit! Completely adjustable children’s full-body harness for the first steps on a slope or cliff. The next generation of mountain climbers will appreciate the great sitting comfort and by using the easily adjustable straps still remain ideally secured even after a pronounced period of the child’s growth. The author Irene Prugger and the photographer Maren Krings accompanied the Mountain Rescue Tirol for over two years during their missions and training. It resulted in a captivating insight of the extensive work by the Mountain Rescue Tirol. You must be logged in to take advantage of the offers in our shop. I already have a membership card but no online account. Are you not yet a supporting member of the Mountain Rescue Tirol? Support over 4,000 mountain rescuers, feel safe in the mountains and take advantage of the unlimited offers in our online shop for only 28 Euros annually for the entire family! The quality has to be the perfect match! "We rely on materials of the best quality during difficult missions. The same expectations go along with our personal equipment". Michael M.